To give you an idea of what you can expect to happen in your back yard during the installation of your new pool, we have broken down the swimming pool construction process into several steps. The Site – Construction techniques vary from concrete wall to Steel & Polymer liner type wall systems. 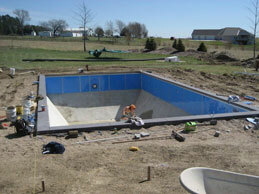 The first step of either type of pool begins with placement of the pool on the yard. In some cases, homeowners will work with a landscape designer, which can assist with placement of pool and complete landscape design. Utilities/Permits – Next locating & if necessary move utilities. Permits are taken. 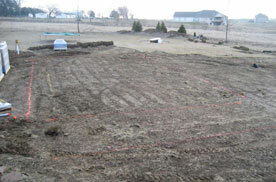 The pool is laid out on the ground & excavation begins. 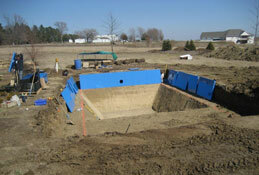 Excavation – Pool excavation is usually accomplished in one day. 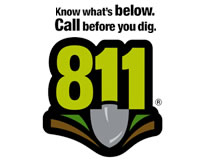 Excavation is done with a backhoe or excavator while dump trucks haul dirt away or dirt can be piled on the job site for grading, berms or landscaping. Our experienced crew will shoot elevations, place reference points & performs hand work with shoves & rakes as pool excavation goes on. Pool Structure – The second day of construction usually consists of setting walls & braces or setting forms & rebar depending on pool wall type. Once these are set appropriately a concrete footing is poured around the outside of pool wall or inside of forms to create a poured concrete wall. 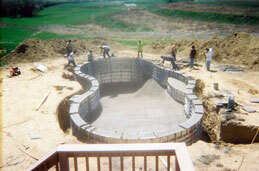 The pool bottom is then shaped, elevations set and a base of Pool Crete is poured covering bottom of the pool. Utilities, Plumbing & Equipment – Next, the plumbing, lighting, & electrical needs are placed. 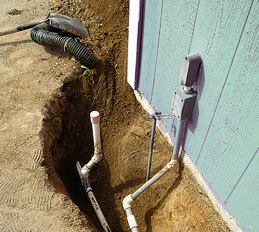 A trench will run from the pool to pool equipment pad too accommodate plumbing & electrical lines. Equipment pad (concrete) is usually four foot by eight foot. 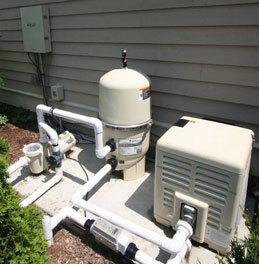 A pump, filter, heater & sanitizing system will sit on this pad. Electrical, gas lines & drain lines will be ran typically from house to equipment pad. Inspections – At this point all the necessary inspections will be completed. 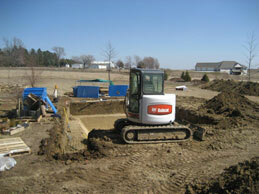 Backfilling & Pool Deck Installation – Over dig around pool & trenches will be backfilled with either pea gravel, or dirt. Grading around the pool is done to accommodate the pool decking. 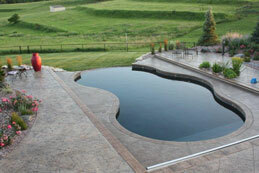 Most pool decking is concrete, different finishing stamps & colors are available along with pavers or stone decking. Install Vinyl Liner, Fill Pool & Start Equipment – After pool deck is completed the vinyl liner is installed & pool is filled with water. Pool equipment is started and chemicals are balanced. Install Automatic and/or Winter Cover – If an automatic cover is part of the package it will be installed once the pool is full of water. Last, mesh winter cover is installed. The pool is Ready to Use, Let’s talk about Equipment and Safety – Pool orientation will be completed with homeowners on pool, equipment, cleaning, chemistry, operations, warranties & safety information’s. A safety sign off sheet will be gone over at the time of orientation. The homeowner will receive a copy of signed safety information along with a copy of written instructions of operations, chemistry & owner manuals. Enjoy Your New Pool! – We are always only a phone call or e-mail away to provide any answers to your questions. 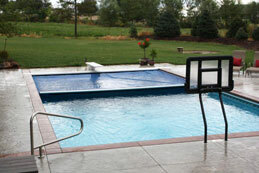 Most layout, locating of utilities, excavation, trenching, plumbing, electrical, gas, equipment pad and lighting are like vinyl liner pool construction explained above. Differences in the process are described below. Also, please see the animation of the construction process at the bottom of this page. Excavation & Pool Structure – Construction process of concrete pool shell starts with excavation then placing compacted gravel bed on floor portions of the pool. Aluminum concrete forms are placed to pour vertical walls, Rebar is placed inside forms & pool floor and walls. Plumbing, lights, bottom drains, skimmers & return fittings are also placed prior to electrical bonding and inspections. 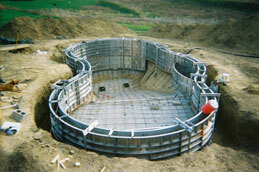 Concrete Pour / Finishing – Concrete is placed in forms & through out pool floor & walls. Forms will be removed the same day of concrete pour or next day. Concrete is grinded to remove any imperfections. An application of bonding component is applied. Water line tile is installed. Pool coping & pool decking are poured. 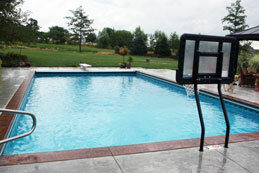 Pool surface is coated with plaster, paint or epoxy coating.